America’s largest and fastest growing “church,” Lakewood Church in Houston, Texas, often finds itself with guest speakers in the pulpit. 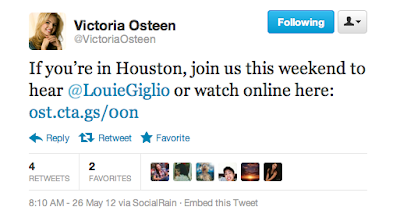 With pastors Joel and Victoria Osteen traveling often for their own “Night of Hope” events, or for other special speaking engagements, it must be helpful to know so many prominent pastors and speakers who would willingly substitute on any given weekend. 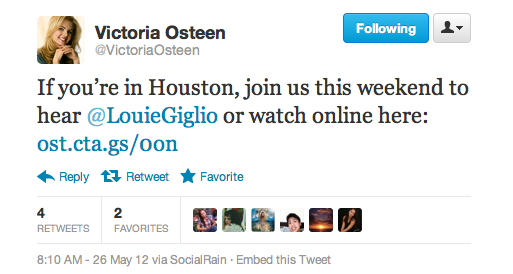 Louie Giglio is the pastor of Passion City Church in Atlanta. He is also the founder of the Passion Conference. Back in January, a strange thing occurred at Session 5 of the 2012 Passion Conference event. As was reportedon this blog at that time, speakers Louie Giglio, Beth Moore, John Piper and others engaged in a Scripture reading exercise followed by a time of silence and meditation while the audience of young people was instructed to “be still” as they waited to “hear” from Jesus. This exercise can perhaps best be described as “Lectio Divina lite.” When did Protestant leaders begin to teach that we have the Bible “plus” anything? God has spoken perfectly in His Word. We have no need to be still and wait for His voice. It is curious, then, that Giglio, the founder and leader of the Passion event, would also be preaching at the one of the largest Word Faith churches in the country. But then, mysticism and the false, heretical prosperity gospel are both fruits plucked from the same bad tree.